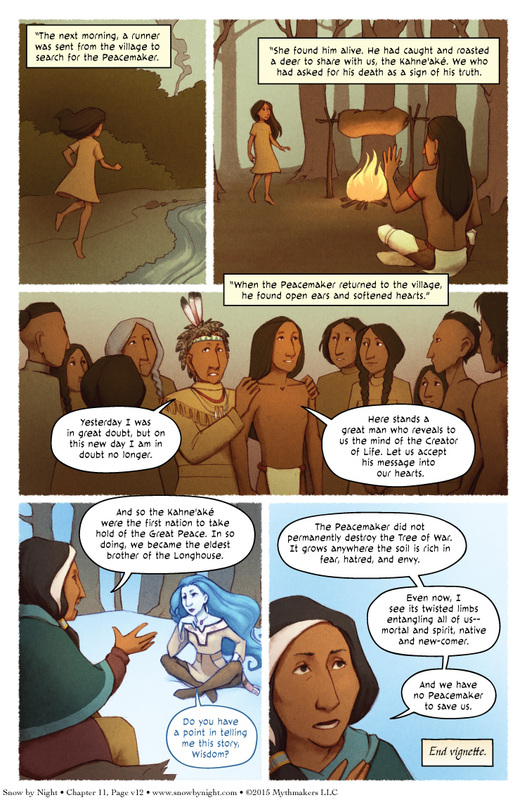 The Peacemaker returns to the Kahne’aké on Page 12 of The Peacemaker and the Tree of War. Did he die from the fall and get better? Did he just vanish into the river and never died at all? The legend is unclear, but he met the requirements of the test the Kahne’aké laid out for him. But the Tree of War is always growing, even as we cut it back. The Wisdom is right to be worried. My thanks to Kristen Kemper who jumped on this vignette at the last moment and met a very demanding update schedule. She was essentially finishing a page every 3 days. Fantastic job, Kristen. Good luck with your webcomic, Sylvania, and I’m hoping to bring you back to work on future vignettes. No update this Wednesday or Friday due to Thanksgiving. Chapter 12 The Vault begins on Monday, November 30. We’re going back to where we left Blaise and Defiant Elk to start with, but the bulk of the chapter involves Jassart and Vivienne. Have a great holiday everyone, and I’ll see you next week! Hat tip to Kristen Kemper as well! The art in this vignette has been very cute and warm-feeling, fitting I’d say for an idealist story like this. Excellent work. Kristen did a wonderful job (and so did you) with this vignette. That final line tears me up inside a bit. Have a wonderful Thanksgiving, and we’ll see you later. Definitely no Jassart and/or Vivienne. There’s a young Elk out there on a cliff whose posture at this second looks strangely like the Tree of War. I hope he gets renamed Mighty Elk after he figures out a couple of things–he’s obviously extremely bright, but it’s going to be a steep learning curve. The Warrior who doesn’t respect his Wisdom–uh oh. Blaise, start talking FAST. I can definitely see that happening! Sure the tree of war grows. IMHO it already rivals Yggdrasil. I just got cold chills. Someone get this woman a mic to drop.